How did you spend your summer? 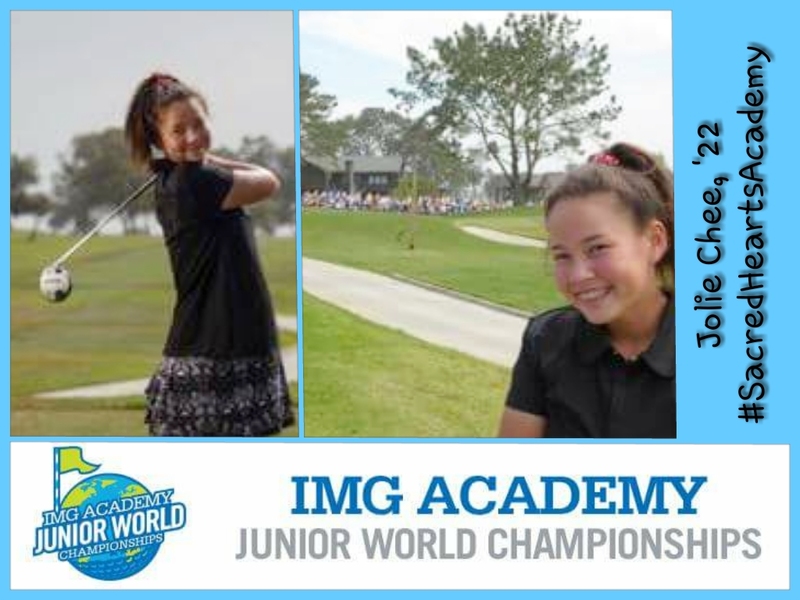 Jolie Chee, Academy 8th Grader, spent her summer competing in the IMG Academy Junior World Championships held in San Diego, California. To receive an invitation to compete, Jolie played in a two day tournament on the Island of Kauai, placing in the top five! The IMG Academy Junior World Championships lasted three days, with Jolie shooting a four over par 76 on the first day. On the second day she shot a two over par 74; followed by a seven over 79 on the final day. In all, Jolie placed 22nd out of 100 participants, and was named the top 11-12 year old from Hawaii! Jolie shares, "Playing in this tournament taught me knew skills about patience and persistence, I will use the new skills I learned to better myself in both intermediate and varsity golf in the coming years." Way to go Jolie, we look forward to following you on your future endeavors in athletics! Sacred Hearts Academy sophomore Aubree Davis earned a Silver Medal for her presentation on Bees at Global Natural History Day in Chongqing China, July 19-25. Davis’s research explored the critical role bees play in food pollination, the global economic impact of bees, and factors contributing to causing a worldwide decline in bee populations. She provided an analysis of the loss of pollinators on the world’s food supply and offered solutions for addressing the decline. Sacred Hearts Academy Social Studies teacher Kinga Wojitas served as the advisor on the project and accompanied Davis to China. Teams from 90 countries throughout Asia, China and the United States participated in this year’s GNHD, presenting topics relating to the theme, “Scale of Nature: Micro to Macro.” The challenge given to students was to explore a science-related topic by conducting in-depth research using reliable information and rigorous analysis. Students shared their understanding of science by presenting their analysis to a panel of scientists, researchers, and educators. The educational program is presented by the Behring Global Education Foundation. Global National History Day is an international educational program designed to inspire elementary and middle school students’ interest in natural science and history.